This is Dean Smith. He really, rilly loves his lady, Jennifer. On Jennifer's birthday last year, he realized he wanted to get married—but he couldn't just propose, now could he? Bo-ring. That's not going to get anyone's attention. And attention is what matters, which is why Dean crafted something truly chilling. 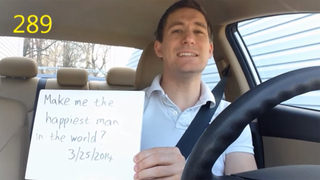 Dean wanted Jennifer to know that she's "literally" on his mind "every moment of every day" (giant red flag right there), so he decided to concoct a proposal video that took the idea to the extreme. And so for a full year leading up to Jen's next birthday, Dean secretly took daily videos of himself with a whiteboard featuring a marriage proposal. The whiteboard proposals take place everywhere: the shower, at work, with the dog, while he's doing pushups or mowing the lawn. Even in front of Jennifer herself while she's sleeping. Dean assembled the 365 clips into a giant "countdown" video. Time for the big reveal! While celebrating Jennifer's birthday with her family in Aruba, Dean was ready for his beloved to see just how lucky she was to have him. Jennifer's family led her down to the beach (via whiteboard messages, because Dean understands the importance of thematic consistency) and made her watch Dean's masterpiece, which clocks in at THIRTEEN MINUTES. As the video ended, Jen stood up, turned around, and saw Dean with his stinking whiteboard. There, in front of an audience (of course, always an audience) consisting not just of her family but dozens of random beach gawkers, he got down on one knee and she said yes. Then Jennifer burst into tears, realizing that she'd just agreed to marry a man who forced her to stare at his face for thirteen minutes on her birthday.